The next time the clerk at the store asks you if you want paper or plastic, why not ask for something better? Single-use plastic bags are made using natural gas or petroleum. As a matter of fact millions of gallons of petroleum are used each year during the manufacturing process of plastic bags. If using up non-renewable resources weren’t enough, disposable plastic bags are likely to end up as litter, which mars the natural beauty of the land, poses a health hazard to animals and their habitats and ends up costing taxpayer money to cleanup. When single-use plastic bags are not discarded as litter, they are commonly tossed in the trash and dumped in landfills. This outcome is unacceptable because plastic does not safely breakdown. Plastic sits in landfills pretty much forever just taking up space and possibly preventing biodegradable materials contained within plastic bags from biodegrading. The best case scenario when it comes to disposable plastic bags is recycling but the problem with recycling is that only maybe 11 percent of the plastic bags handed out are recycled. When compared to landfilling or litter, recycling is the best choice, but it is also an underutilized option. According to the American Forest and Paper Association, in 1999 the U.S. alone used 10 billion paper bags. This translates to a lot of natural resources. In recent years there have been some major changes in the paper industry. Many forests are sustainably managed, alternative forms of energy are commonly used to power the production process and paper recycling rates hover at about 65 percent in the U.S., making it one of the most recycled materials. Despite the changes for the better there is still a significant carbon footprint tied to using paper bags. If you are looking for a bag that doesn’t have the environmental impact of single-use plastic or paper bags, consider reusable shopping bags. 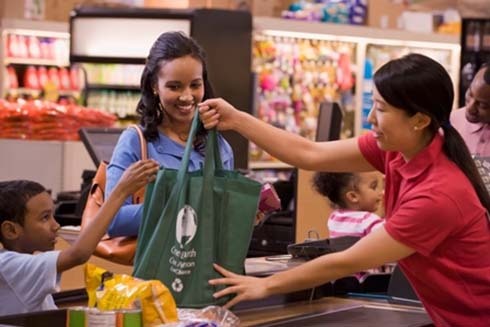 If you pick up 3 – 5 reusable grocery bags and bring them to the store every time you shop, you can get your goods home without all the environmental baggage of paper and plastic alternatives. Under regular use, a reusable shopping bag normally last 3 – 6 years, which is obviously a lot longer than what you can expect from disposable bags. When looking for a reusable grocery bag for your brand’s marketing or for personal use, look for something that is durable and well made since you will use it to haul home some pretty heavy items from time to time. Consider recycled and sustainable materials, like propylene, cotton or jute since this will further reduce the environmental impact of the bags and you can safely and easily recycle, compost or landfill the bags when they’ve fulfilled their usefulness. The next time you are at the checkout, don’t settle for single-use plastic or paper bags. Use something better. It’s easy, just grab a reusable shopping bag.